Around 40 visitors came on 13 May to our 7th Arab film and discussion evening in Zille-Haus in Berlin Moabit. The focus this time was Lebanon. After the screening of the documentary „Lebanon – Resisting Lunacy“ by Uwe-S. Tautenhahn, Henrik Meyervon, a Middle East expert from the Friedrich-Ebert-Stiftung, explained the current situation in the country. 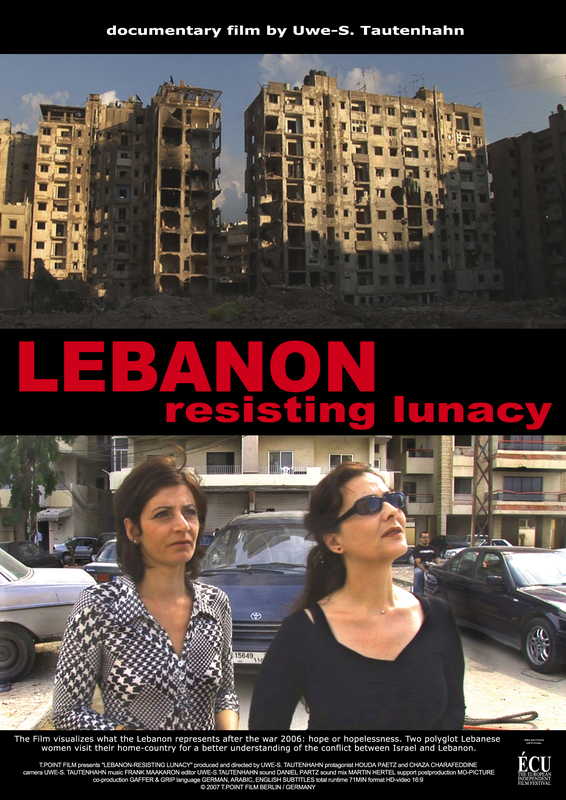 Tautenhahn’s film tells the story of two Lebanese women living in Germany who had decided after the war in Lebanon in 2006, to travel to their home country in order to report on the consequences of the conflict. They portray a country in which the cities and infrastructures were heavily damaged. Sixteen years after the end of the civil war that shook Lebanon from 1975 to 1990, the July War plunged the country into another crisis. 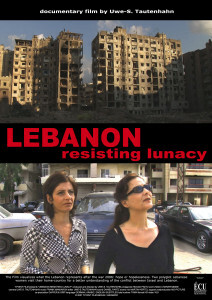 Therefore the words of a taxi driver interviewed in the film are very representative of the situation: „Like everything necessary (…), [like] that sometimes you have to return the clock, so there is anytime again and again war in Lebanon“. Roads and factories were bombed, the economy was destroyed. The country was hesitating between hopeful optimism and resignation. While the Lebanese government condemned the attacks by Hezbollah against Israeli militias, the 33-day War united the religious divisions in Lebanon against the common enemy, Israel. The projection was followed by a discussion about the film as well as the current situation in Lebanon. The guest speaker was Henrik Meyer, Lebanon expert at the Friedrich-Ebert-Stiftung. After a brief sketch of the Lebanese political situation in the early 2000s, he explained how Hezbollah could take its outstanding position in the country after the withdrawal of Syrian troops from Lebanon in 2005 and what dynamic led to the Israel-Lebanon war, which caused in the a very short periode of time a massive migration flow. Just a week after the start of the conflict arrived just in Damascus (Syria) 1 ½ million refugees from Lebanon. Hereafter the following topics were discussed with the audience : Which consequences of the conflict can still be seen today in Lebanon and to what extent the local population got used to the state of war as a normal state. A young man with Palestinian family in southern Lebanon gave us information about his own impressions and completed the picture of a population which is trying to get over the trauma of the war and to build its own country again. The event was organized and moderated by Andreas Fricke (14km). Text and Photography by Elisa Totino, editing Steffen Benzlers (both 14km). At the organization helped Eugénie Rooke (intern at 14km) and Anja Gebel (14km), and the team from the Zille-Haus. El Reda Restaurant in Moabit sponsored with delicious Lebanese specialities. The Youth of the Zille-Haus is supported by the Evangelical clubhouse. We thank all our guests for coming! In regular intervals we screen films which deal with different Arab countries and subsequently discuss the films and the current social and political situation in the respective countries with guests from Berlin Moabit as well as with country experts, always aiming to make links to North-South relationships. The next Arab Film and Discussion Event will take place in the second half of June and will be about Tunisia. The project receives financial support in the context of the quarter management Moabit Ost through funds from the Programme Social City (EU, Federal Government, and Federal State of Berlin). Vogt, Achim (2013): Hizbullah in der Krise :Verschiebungen im libanesischen Machtgefüge? Bickel, Markus (2007): UNIFIL und die politische Krise im Libanon : Mission zwischen allen Fronten?